Claritaz development team also specialises in creating WordPress websites. WordPress as we all know, is a content management system that makes the creation of website easier and more approachable to a lay human being who might not have the technical expertise to code a website from the scratch. There are a few aspects that make WordPress one of the most special content management systems. Creating a website on WordPress does not require extreme levels of coding knowledge but at the same time, requires an intricate understanding of the user interface, the possibilities, the way in which some things have to be left rigid and somethings have to be left flexible for the user. This is where the expertise of Claritaz steps in. 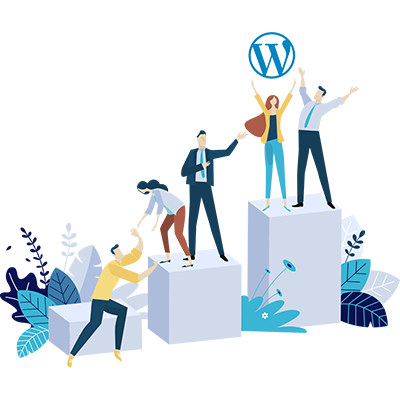 We have our team of WordPress experts who are proficient in coding and they understand you, your requirements and your customers and users to ensure that the aspects of your website that need regular updations are left at your command and that too, in an easy-to-use interface. WordPress Themes - These WordPress themes give a visual identity to your website and each element in the team is carefully and meticulously coded. WordPress Templates - These templates ensure that all the pages of your website have the same tone in terms of appearance and even other elements like font sizes. WordPress Plugins - There are a lot of plugins that are available in the open market, both paid and free. However, if you would like to create your own customized plugin for your WordPress site, we have the essential expertise to create one for you that perfectly fits your requirement! Making a WordPress website is a worthy investment because it is just a one time spend and the basic maintenance cost is what requires. For any minor changes, you do not have to count on your Webmaster but just do it yourself simply! WordPress makes handling your website as simple as handling your Facebook status updates!! The art and science of creating websites who was once confined took a handful of people who had the essential development and coding skills. There were discrepancies and lines of separation between the knowledge, the market, the programming experts and the end users. The entire aspect of creating a website was so technical that the web development companies were overloaded and where overcharging at the same levels. With the advent of the web blog or blogs as we know it, the web became more democratic and even end users started to have their own space on the web with a WYSIWYG interface. Blogspot and WordPress pioneered the revolution of blogging. While blogger had stagnated, WordPress evolved itself into a more robust and more expensive engine which turned out to be a content management system or CMS. Today, WordPress covers more than 35% of all the websites present on the planet.